We were delighted to receive two invitations to talk about the toilet at World Toilet Day events. Elise Cartmell presented the Transforming Waste consortium's work on anaerobic digestion and nutrient recovery from pit latrine sludge in Zambia. Ben Martin introduced the trials we are doing on different technologies to treate the Clean Team waste in Ghana. Ruben Sakrabani talked about our research on the efficacy of Loowatt's human waste derived fertilizer in Madagascar. Peter Cruddas explained what waste streams would be appropriate for co-pyrolysis of pit latrine sludge. Cranfield's technical research was balance by presentations from WSUP on their research into topics such as health impacts and mobilising municipality finance for sanitation. Overall it was a fantastic event that really demonstrated the breadth and importance of sanitation research, and we were honoured that the Nano Membrane Toilet was a part of it. 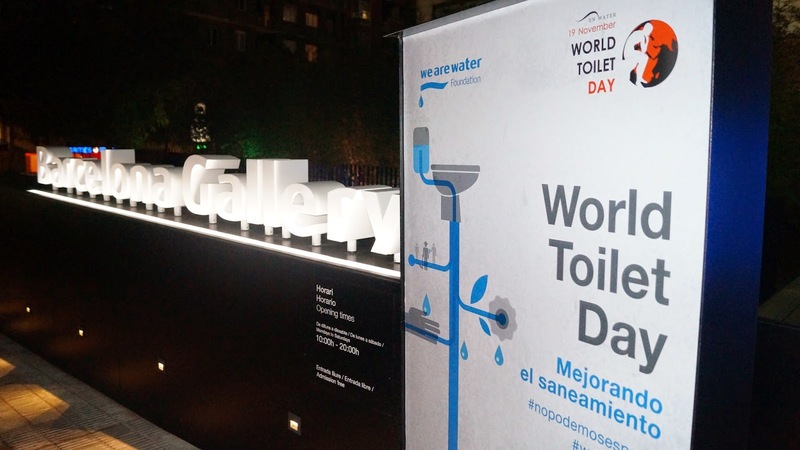 Secondly, Ross Tierney was invited out to join a panel of experts at the World Toilet Day and Improving Sanitation event hosted at the Roca Gallery Barcelona. The other speakers alongside Ross included Xavier Torras, Corporate Brand and Communication Director at Roca; Jordi Corral, Innovation Lab Project Manager from Roca; Mark Frantz, Fundraising Manager from Unicef; Martin Azua a designer and architect interested with particular interest in toilets and bathrooms. The topic of conversation on the night revolved around providing access to sanitary solutions for the most vulnerable people with particular focus on equality and dignity for women and children, a theme we are certainly exploring with the Nano Membrane Toilet.